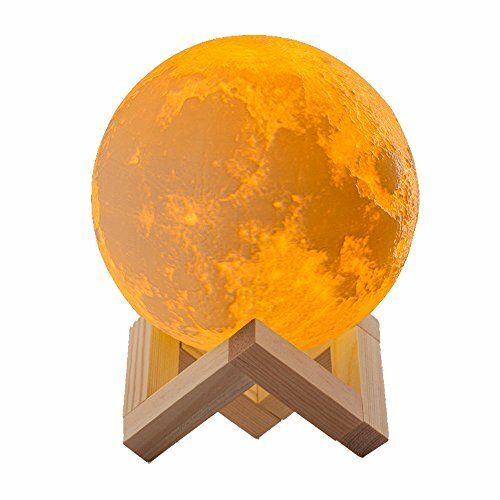 【3D Printing Technology】The nightstand lamps is delicately crafted with 3D printing technology, layer by layer stack restores the real appearance of the moon vividly. Energy-efficient LED lamps create a like-free and comfortable light. 【Vibration Control】Switchable lighting color between yellow, cold white and warm white to create the ideal sleep environment for your baby and families. Three lights are easily switched by tapping the surface of the lamp. 【Good Gift and Decorative Lamp】A great gift for your friends, kids and families on Christmas, holiday, birthday, wedding or anniversary. A creative decorative night light and creates a wonderful atmosphere for home, kids bedroom, living room, dining room, office, college dorm. 【Non-Toxic】Made of environmentally friendly PLA material, non-toxic, odorless. A reassuring gift to your beloved. the product can be used to operate. 【Use Tips】The products has open circuit protection before they go out. To use for the first time, please recharge products for 10 seconds, then the circuit is activated, the product can be used to operate.